On Saturday morning, Templeton firefighters were preparing for training on wildland firefighting techniques. As they were were setting up the exercise on vacant land near Vineyard Elementary School, they received a call about a multi-vehicle crash nearby. The firefighters left the training equipment behind and responded to the accident near Vineyard Drive and Highway 101. The firemen spent about 45 minutes at the scene of the accident. When they returned to the training site, the equipment was gone. Firefighters searched the area but did not find the gear. 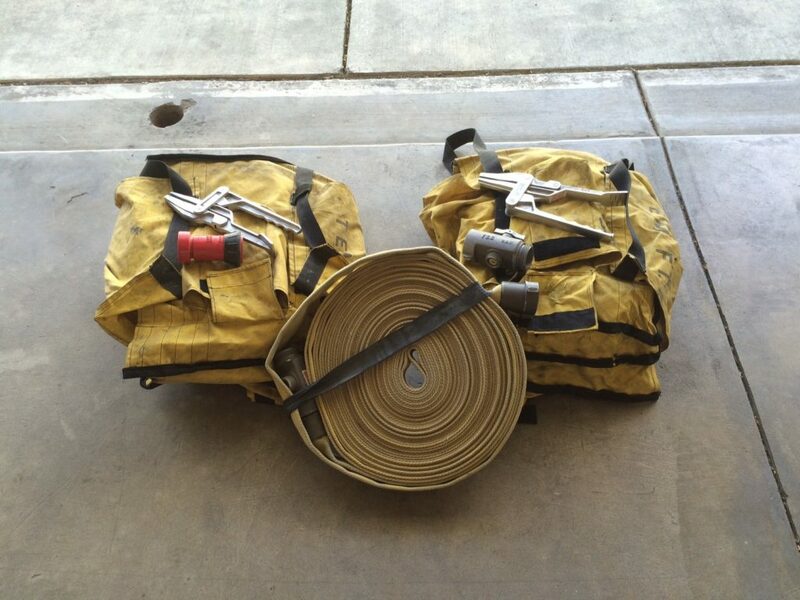 The equipment included nozzles and two hose packs filled with 400 feet of light-weight wildland hose. Templeton Fire Chief Bill White released a statement saying the fire department is saddened by the theft and would like the person who took the equipment to return it. “The individual not only stole from the department, but the community of Templeton since our resident’s tax dollars pay for the equipment,” White said. Fire officials are asking anyone who has information about the theft to contact the sheriff’s office at (805) 434-4290 or Crime Stoppers at (805) 549-STOP. They are also requesting donations to pay for replacement equipment. Interested donors may contact White at chief@templetoncsd.org. The fire department says donations are tax deductible. using police to babysit equipment is an irresponsible use of a resource that has more important things to do to protect public safety. And what volunteers are you talking about? The equipment babysitting volunteer Corp? There aren’t any volunteers. They don’t exist. That’s fantasy and not fact. News flash. Templeton Fire Dept. is a mostly volunteer dept. As a matter of fact for all you public servant haters, 80% of the firefighters in the US are volunteers. My retirement benefit for twelve years of service amounts to fifty dollars a month. Fact is with agencies that rely on volunteers most have a list or such with additional volunteers you can call if one of your scheduled volunteers is sick, has to leave or such as to not be available that you can call, as an example if you need 5 volunteers at a time you likely have several more available. Though I do not know for sure but if indeed the department is all volunteer I would expect for every shift they schedule their “volunteers” when they need “x” number on shift they have more available volunteers and find it unlikely that one of those unscheduled volunteers could not have been left at the training site should the scheduled volunteers have to leave quickly on a call, and find it odd that a agency such as the fire department does not already have a policy addressing the leaving of “taxpayer funded” equipment and risk it being stolen. And if the fire department didn’t train and couldn’t mitigate your emergency…I’m guessing there would be more complaining. Nothing is free in life. You enjoy the security of 911 and responders to help you in an emergency…security has a cost. Firefighters have to train…they have to be paid…they get old and beat up from a hard job and have to retire. We don’t live in the 50’s anymore. The world is different. There are laws, regulations and public expectations about the capabilities of their responders. The training required is extensive, never ending and ever evolving. The volunteer firefighter is becoming a relic, because these requirements are too great to balance with another full-time job. If the fire department had non-critical people on its payroll you’d be complaining about that too. They likely already are, but we certainly know a police officer or volunteer would have likely been available to watch this very expensive equipment. We are always told when there is a rash of vehicle thefts to lock your car and don’t leave expensive items visible, too bad people who are paid very highly from taxpayer dollars don’t head the same advice. A. Templeton Fire Department is a VOLUNTEER department. B. There is no such thing as a non-critical person. The apparatus are staffed to a level that provides for public and firefighter safety. Everyone is essential. There isn’t anyone to leave behind to babysit equipment. They train on duty to save the taxpayers overtime costs. I know hindsight is always 20/20, but could they not leave one person behind to keep an eye on it? Heck, call an LEO or some other person to watch over it all. Where was the fire chief? Could s/he not muster up someone to pack up the gear, etc? A somewhat expensive lesson learned (I hope). A lesson that the taxpayers get to pay for and not the person who left the equipment in the first place. I find it odd that there is not a policy for NOT leaving equipment, or at least watched, if an emergency arises. Agencies are always full of policies, but then again apparently Arroyo Grande didn’t have a policy against using public offices for “cough couch” sobering up. I find this infuriating! It’s either kids being dumb and not thinking about their illegal actions or drug addicts thinking they can pawn the stuff for their next heroin fix. Disgusting. Don’t fall asleep with your mouth open too long or you might get the gold fillings stolen out of your teeth! “our resident’s tax dollars pay for the equipment” the taxpayers did not leave the equipment why are they responsible to replace it? Should not be the people who left it have to pay to replace it, where is the personal responsibility? Good thing you weren’t the one in the car accident eh! It sounds like you think they should have stayed long enough to load equipment before going to an accident. In this case it is not the fire depts fault, they are legally bound to go help when called upon. This is the jerk face who stole the equipment fault, plain and simple. I would rather pay for hoses to be replaced than the retirement package these guys get. The amount tax payers have to pay into their 100% benefits at retirement, which I think is 50 years old, now that is criminal. I would have hoped that they planned better for this training by either making sure they had their area covered if a call came in or arranged to have a non-critical person stay behind in case they had to go on a call and leave equipment, and what if that equipment they left behind was needed on their call? “I would rather pay for hoses to be replaced than the retirement package these guys get”, guess what, you get to pay both now, and if they catch the person who stole the equipment you get to pay for him too, aren’t you lucky.